The Ekol Clarity 5 is a multifuel 5kw steel stove with a cast-iron door. This stove represents excellent value for money (£599 as of December 2014). As with many Ekol stoves the Clarity has an internal baffle designed to add preheated air to the combustion process. This assists the Ekols to be particularly clean burning but also means that the stove cannot easily be swept through the stove (it is possible but in my opinion not something a chimney sweep is going to be happy with). This is easily sorted by having a sweep’s door in the vitreous pipe close to where the pipe exits the stove. The firebox is larger than the Aga Little Wenlock but not as large as the Monterrey 5, taking logs of 24cm length (again not much height in the firebox). 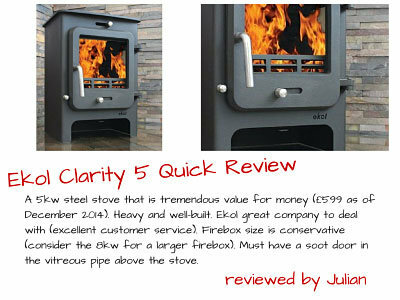 For more room consider the Clarity 8, as the firebox is larger (and you can always burn 3-5KW of logs in your 8KW stove). The Clarity stoves are extremely well priced and you get a lot of stove for your money. 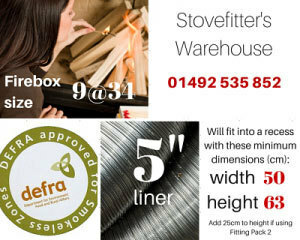 Weight is 67kg and quality is very good with 5mm steel sides and an 8mm steel top (as an example the cheaper stoves such as the Saltfire ST1 and ST2 often have 3mm steel). As with the Monterrey there are no firebricks to worry about. Both air controls have plenty of movement. Efficency is a very laudable 80.3%. 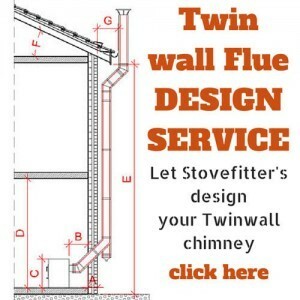 Ekol Stoves design and distribute from Dorset and all stove bodies have a five-year guarantee.